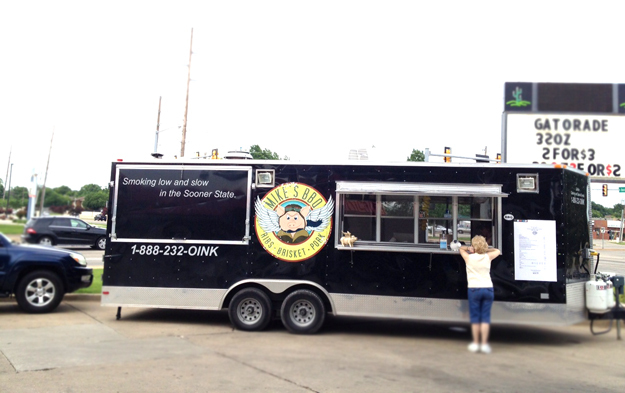 We have a new king of BBQ in South Tulsa (well.. when parked on the South-side most Fridays and Saturdays), and it’s none other than Mike’s BBQ, a bbq food truck that specializes in incredible, delectable ribs. 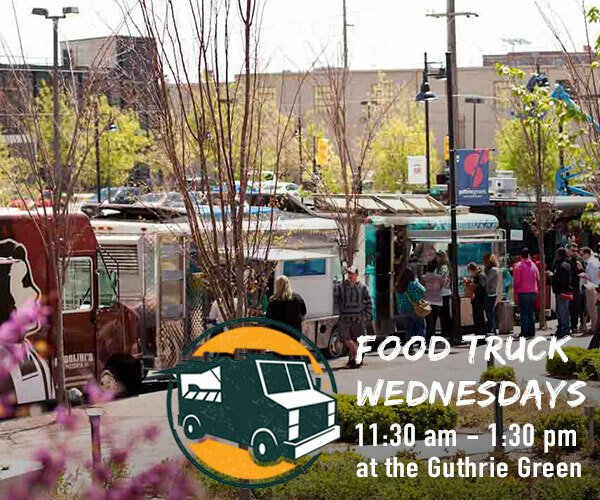 Yes, you heard me…a food truck. 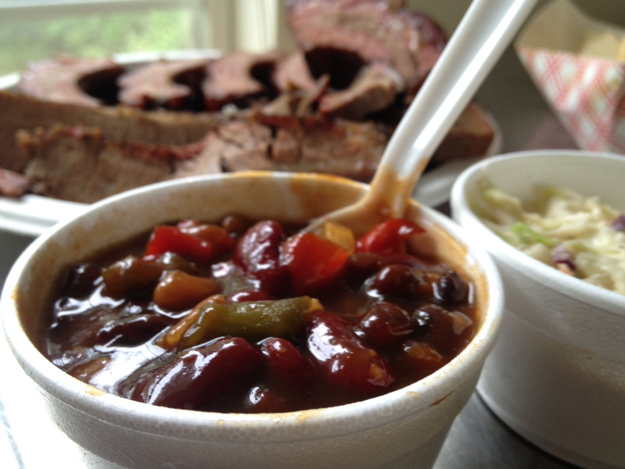 For years, I noticed this side of town was sorely lacking any kind of BBQ perfection. 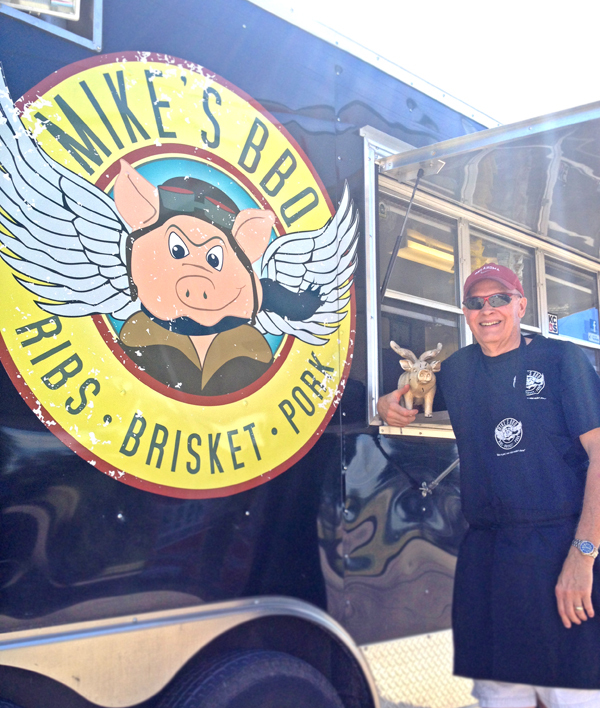 I’ve since gotten a big taste of Mike’s and his rendition of hand-rubbed smoked ribs and mouthwatering, homemade sides. Today, that cloud has lifted. Imagine ribs cooking low and slow all day, with succulent meaty consistency and pull off the bone goodness. Imagine the rub so full of spices that every bite is the boldest and most savory experience you’ve ever had. Well, that’s Mike’s for you, and, that’s just the ribs. Wait till you try the brisket and oh, the beans…and did I mention the coleslaw… and yes, it all comes out of this trailer right here. My hunger pangs started around 3pm. I walked up to the truck and heard a voice saying, “you look hungry.” Yes, I was starving and in dire need of some life giving BBQ that could fill up my belly and soul. So I ordered half a rack, plus a half-pound of brisket, beans and coleslaw. I was thinking 2 -3 meals ahead, right? I got my meal, sat down and found my way to BBQ bliss, sparing little of it for leftovers. Believe me, you can’t get ribs this good in South Tulsa, maybe even all of Tulsa. They were tender and juicy with just the right sublime smoky flavor. 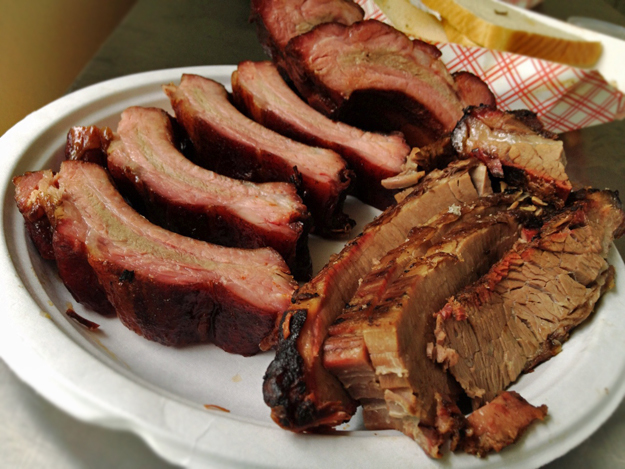 I talked to Mike Richardson a little and asked him what made the perfect smoked rib. He told me temperature, timing, and certified Angus Beef. You have to be obsessive about the quality for it to be the best. He only follows KCBS standards and makes everything by hand with incredible loving care. The rub he puts on is his own proprietary blend… it’s absolutely magical. Fortunately, Mike’s is not just limited to South Tulsa (91st and Deleware). That’s just where he parks on most Fridays and Saturdays. You can also find him at American Airlines Monday, Wednesday, and Fridays. His hours are 11am until dark. The best idea is to follow him on Facebook to see exactly where he is. Or, you can call ahead and order whatever you want for however many people you’re wanting to serve. Stop by today and try it yourself. I might even be there to coronate my go to BBQ joint in South Tulsa. Not an official ceremony, mind you, just a subtle acknowledgement that the throne has been filled. We are, after all, in the presence of royalty.